I knew that I wanted Moana to be my next Disney painting. So I wanted to make sure that I created an image that truly encapsulated the spirit of the film. And in my mind the most important scene is when Moana restores Tafiti's heart and saves the world. 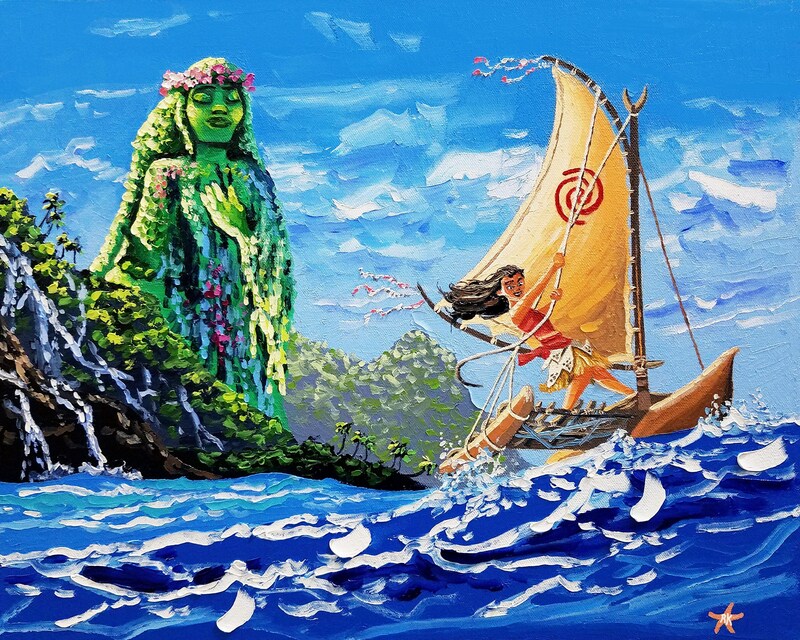 This original artwork depicts a grateful Tafiti with her hand on her heart, as Moana sails away on her raft. It's a dramatic and action packed scene, with the waves, motion of the sea, and Moana pulling on a rope to adjust her sail. I can't wait to continue to paint scenes from my favorite Disney animated films. **This Disney scene was painted using oil paints. It was created on high quality cotton canvas and is stretched and ready to hang. The sides of the oil painting are painted *black* to give the art a professional look. You can hang it right out of the box! **This Moana painting is 16 by 20 inches in size and comes with a certificate of authenticity, signed by me. The colors and rich textures of the painting make the work pop off the canvas. My 3-D style is very exciting and makes my art unique.